In this article, you will know a dreaming GUI tool that help you capture screen with OCR technology – screen capture of VeryPDF Screen OCR. 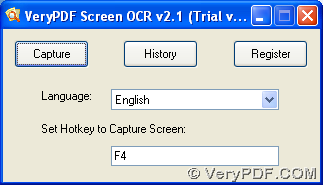 VeryPDF Screen OCR can also be named as screen capture, for it helps you capture screen flexibly and extract characters on screen into text file with OCR technology variously, wherever you want to extract characters of webpage, images, PDFs on screen, screen capture always help you with that with no doubt. You can try free VeryPDF Screen OCR here, too. For more software, please go to official website of VeryPDF. 1. Please set hotkey and language on opened GUI interface of VeryPDF Screen OCR in order to get quicker and accurate processing with OCR technology later. Click hotkey you set just now or directly press capture > draw a rectangle on screen with left button of mouse pressed continuously. When you think this rectangle can cover all character that you want to process with OCR technology later, please loosen your left button of mouse in a proper position on screen > click OCR button below the rectangle. Then, you can get 2 panel popping on your screen, where you can review extracted character and history of all screen capture you did in your computer with this software. Then, if you want to save your characters in another folder in your computer, please go to click File – save text as – select one folder in pop dialog box – click save. Then, you can freely and flexibly edit extracted characters from your screen. If you feel confused on details of how to capture screen and OCR screen with VeryPDF Screen OCR – screen capture here, please drop your comment here, our support can provide you with accurate solutions than you imagine always, thank you for reading this article here! Do you know how to OCR Screen conveniently? How to use Screen OCR? How can we recognize screen character? VeryPDF Screen OCR recognizes text on screen via OCR. 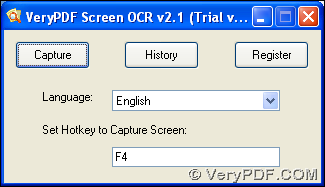 VeryPDF Screen OCR is a smart screen capture tool and character recognizer. This entry was posted in Screen OCR and tagged capture screen, OCR screen, OCR technology. Bookmark the permalink.